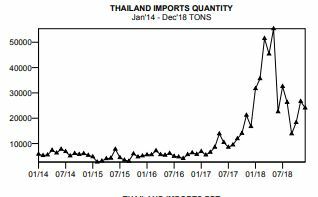 Thailand shipped 2.9 million tons of ethylene polymers in 2018, up 13% from the prior year. Propylene polymer exports were 1.1 million tons, up 26%. Asia-Pacific was by far the largest export destination, with less than 10% of the total shipped to other regions, the next largest volume going to Africa. Although exports of styrenic polymers were smaller, 516,000 tons, they showed the highest percentage increase, up 39% on polymer shipped almost entirely to Asia-Pacific. Recycle polyethylene imports were 168,000 tons, up from minor volumes in the prior year, polymer also mainly from Asia-Pacific, followed by North America. Thailand exported 380,000 tons of PE film/sheet and PE bags/sacks in 2018. Asia-Pacific was the largest export destination but over 100,000 tons was shipped to North America. From International Trader Publications’ 2018 Thailand Polymer Trade Report, a 50-page online publication based on statistics from Thailand and analyzing Thailand’s trade in commodity polymers, recycle polymers and fabricated plastic products.